Zest of 4 oranges (about 2 tablespoons) or ½ cup dried tangerine peel (found in Asian markets) soaked in a small bowl of hot water for 20 minutes, drained, and minced. 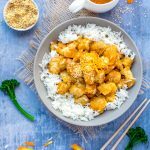 Make The Orange Sauce: In a large bowl combine orange zest (or minced tangerine peel) with the orange juice, rice vinegar, soy sauce, wine or sherry, sugar, cornstarch and salt. Mix until the cornstarch is fully dissolved. Heat oil in a large skillet over medium high heat. Add garlic and ginger and cook, stirring, until fragrant, about 1 minute. Give the sauce ingredients a stir and pour into the pan. Once it comes to a simmer, cook, stirring, until the sauce thickens enough to coat the back of a spoon, 30 seconds to a minute. Transfer sauce to a bowl quickly to stop the cooking process. Set aside to cool. When cool, the sauce can be stored in an airtight container in the fridge for 1 week or in the freezer for up to 2 months. Marinate The Chicken: In a large bowl combine chicken pieces with the 1 tablespoon oil and ½ teaspoon salt. Mix well and let the chicken marinate for 10-15 minutes. Pour the beaten egg into the bowl with the chicken and mix well. Add cornstarch and toss to form an uneven coating with little bits of dry cornstarch left unincorporated. Stir Fry The Chicken: Heat oil in a large nonstick skillet or wok over medium-high heat until hot. Add all the chicken to the pan, spreading it out into a single layer. Use tongs to separate the pieces of chicken if they’re sticking together. Cook the chicken undisturbed for 2-3 minutes, or until the bottom turns golden. Flip to brown the other side and cook for another 2-3 minutes, until golden and cooked through. Transfer chicken to a plate. Remove the pan from the stove and let it cool for 2-3 minutes. Wipe out the extra oil from the pan using a couple of layers of paper towel attached to a pair of tongs. Return the pan to the stove over medium-high heat. Return chicken to the pan and pour in the sauce. Stir for 30 seconds or until chicken is coated with sauce and heated through. Add garnishes if you like. Serve hot. Peanut oil is delicious in this dish and it has a high smoke point which is ideal for stir frying. If you can’t find peanut oil or you have an allergy, other oils that work well in this dish are avocado oil, sunflower oil or grape seed oil.